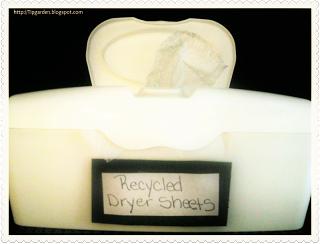 The Frugal Pantry: Recycling Dryer Sheets: Quadruple Your Savings! Recycling Dryer Sheets: Quadruple Your Savings! So, you've read how to make your own dryer sheets, but you still love the convenience of the commercial ones. I use them too, and cut them in half, since almost no load of laundry actually needs to use a full sheet to soften and remove static. As I'm sure you've heard or discovered, you can also reuse a dryer sheet for at least one more additional load in the dryer before it loses it's goodness. I have developed a little system that works for me to help me get the most out of my dryer sheets (and my budget!). 1) It is super simple yet pretty efficient too. First things first. When you get a new box of dryer sheets, grab a pair of scissors and cut the sheets in half and put them back in the box. 2) To set up a recycling system, grab an empty container or jar. I prefer an empty baby wipes container for this project. Label container as Used/Recycled Dryer Sheets. 3) Every time you fold your clothes, grab the used dryer sheet when you find it and shove it into the recycled container. 4) When you have used the entire box of new dryer sheets (which will take a while, since you've doubled the quantity by cutting them in half! ), simply start using the recycled sheets from the container you made. Discard the sheets this time, or see the end of this post for some additional ways to use them. When you finally run out of all those recycled dryer sheets, it's time to buy a new box and start over. So did you do the math? If you started with a box of 80 dryer sheets, and cut them in half you now have 160 sheets for the price of 80. Then if you save them all and use them a second time, you now have 320 sheets for the price of 80 sheets! Now that is a wise investment! Rub a dryer sheet on your base boards to eliminate dust from settling on them. Dryer sheets act like a tack cloth so great for removing pet hair from upholstery. Run a threaded needle through a dryer sheet to prevent the thread from tangling. How do you use your dryer sheets?